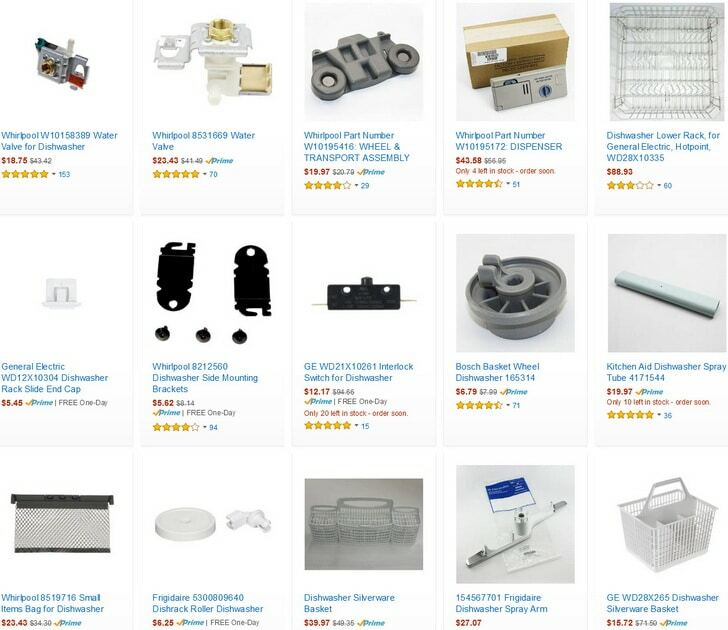 Here is a list of Dishwasher error codes for Frigidaire, Fisher & Paykel, GE, KitchenAid, Bosch, Kenmore, Hotpoint, Haier, Electrolux, LG, Maytag, Asko, Samsung, and Whirlpool Dishwashers. These fault codes are for the Dishwasher models listed. This list may not include your specific error code. If you cannot find your Dishwasher brand and or error code below, go to the bottom of the page and ask us. We will be happy to assist you with your Dishwasher error code and can help you to troubleshoot your specific Dishwasher issue. If your Dishwasher error code is found below, this error list will tell you what part is faulty or has failed. This list is based on the Dishwasher manufacturers list of error codes. 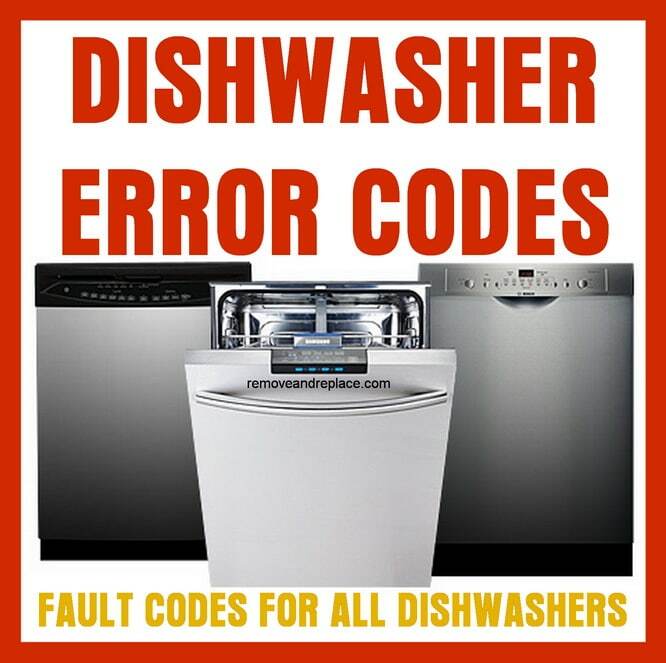 NOTE: For more Dishwasher error code details and information, click the DISHWASHER BRAND NAME link to go to the specific Dishwasher error code page. This code is displayed when you enter diagnostic test mode and get saved fault codes from the control memory. The E0 code is displayed when no fault code is recorded. No water in dishwasher or not sensing water. Inconsistency between level on electronic pressure switch and level on anti boiling pressure switch. Fault on the wash motor circuit. On some Electrolux dishwashers the motor has a control board located at the back at the bottom just behind the wash motor. Fisher and Paykel Dishwasher Dishdrawer Error Code E1 = The first 2 program indicator lights are flashing. The door is not completely closed. Fisher and Paykel Dishwasher Dishdrawer Error Code E2 = 1 and 3 program indicator lights are flashing. Fisher and Paykel Dishwasher Dishdrawer Error Code E3 = 1 and 4 program indicator lights are flashing. Drain hose is too low or the wash water level is too low. Fisher and Paykel Dishwasher Dishdrawer Error Code E4 = Program indicator lights 1, 3, and 4 are flashing. Drain hose is too high. Drain hose is kinked. The water is not draining out. Fisher and Paykel Dishwasher Dishdrawer Error Code E5 = The first 3 program indicator lights are flashing. Water supply hose is crimped or bent. Drain hose is too low. Water tap not turned on. Not enough water supply pressure. Fisher and Paykel Dishwasher Dishdrawer Error Code E6 = The first 4 program indicator lights are flashing. Bad temperature sensor and or element. Clogged filters or a restricted drain line has been detected. A leak or over flow of water has been detected in the bottom pan. Add detergent and latch the cup. When the problem occurs, the cycle will not start. You can override this by pressing the start pad again without opening the door. The cycle will be cancelled on models with leak detection. The temperature of inlet water is out of range. The water in the dishwasher is not to the correct level. Open the dishwasher door and remove the filters and check the filters in the bottom of the dishwasher are clear of debris. Low or no water pressure. Check the water supply is turned on and has sufficient pressure. Locate the water supply valve, and shut off the supply, which will prevent any more water from flowing to the dishwasher. Electronic control board detects stuck relay on the circuit board. Damaged or bad memory on the control board. The electronic control board has detected stuck key on the control panel. The electronic control board detected no communication from the control panel. There may be a break in the wiring or the thermistor/OWI failed. The thermistor/OWI circuit has shorted out electrically. OWI (Optical Water Indicator) failure. The electronic control board detects no circulation in the pump motor operation. Door won’t shut or latch. Dishwasher door will not open. The electronic control board does not detect water coming into the dishwasher tub. Water inlet valve has electrical issue. Soap suds or air is in the water pump. The float switch is open position. Incoming water is not hot. Heating element does not heat. Heating element will not turn off – Constant heating. Slow water drain from dishwasher tub. Drain pump has an electrical problem. Electronic control board is not able to detect the position of the diverter. Diverter is stuck in on position. The diverter disk is missing or has come loose. Lower spray arm error – Not moving. Vent wax motor electrical problem. OE error code on the dishwasher display is telling you that the unit is detecting a drain issue. LE error code on the dishwasher display is telling you there is an issue with the motor’s proper operation. HE error code on your LG dishwasher means it has sensed a heating or heater issue. FE error on your dishwasher means that your unit has a filling error. CE error code on the display of your dishwasher means an error with the motor’s operation. PF error code on your LG dishwasher tells you a power failure has occurred. This feature is to protect your dishwasher in case of a power interruption. tE error code on the display of your dishwasher means a thermal error. iE or 1e error code on the display means water inlet error. There may be a break in the electrical wiring OR the thermistor (water temp sensor) component failed. The optical water indicator that detects the amount of debris in the water may have also failed. Dishwasher thinks that the door is open. More Dishwasher troubleshooting for Fisher & Paykel Dishwasher Error Codes, Frigidaire Dishwasher Error Codes, GE Dishwasher Error Codes, ASKO Dishwasher Error Codes, Hotpoint Dishwasher Error Codes, HAIER Dishwasher Error Codes, KitchenAid Dishwasher Error Codes, Kenmore Dishwasher Error Codes, Electrolux Dishwasher Error Codes, LG Dishwasher Error Codes, Maytag Dishwasher Error Codes, Bosch Dishwasher Error Codes, Samsung Dishwasher Error Codes, and Whirlpool Dishwasher Error Codes. Need assistance? Please leave what type of dishwasher you have and what error code you are getting and we will be happy to assist. Hi I have a SVAN SVJ310XD dishwasher and I just get 2h on the display and won’t start, any help would be great full. Hi. I have a Westinghouse WSF6608 that has stopped working. It is showing an error code “F9” which the Uers Manual shows “Flow Control Valve position error”. Not sure what the Flow Control Valve refers to. I have a pdt660ssf2ss GE dishwasher that has just showed an E8 code on the options window. I can not find any information online as to what this means. This dishwasher is only a couple months old, but has been emitting a very rank smell between cycles. I have the same issue. Did you figure it out? If not I noticed by taking off the drain filter on the bottom of the tub there is water inside and it might not be draining properly maybe the pump, solenoid, or something else? I have a Bush dishwasher dwfs 146w it has a flashing code of e5 and also e2. Hi there. We have an EISNO and it’s showing an E9 . What is this error and how do we fix it ? My Bauknegt dishwasher stops halfway indicating errorcode F8 E3. Filters clean, cables/tubes all fine. Can it be a software/printboard problem? Bijnkers. Vogue dishwasher no water then 3in1 light comes on any ideas? I have a new GE Profile, Model #: PDT660SGFWW, which shows an Error code E1. There is some water at the base of the dishwasher. I have a brand new Stainless Steel Profile GE dishwasher model and it I cannot seem to get it to start. The code reflected is the number 50. The manual does not explain what that mean. When I hit the start button, nothing happens. Can you advise what needs to be done? GE Dishwasher Error Code F50 or 50 is a Temperature sensor failure. -Shut off power to the dishwasher and check the wiring connections on the temperature sensor – located on the flood switch. -Check the resistance of the temperature sensor. -It should measure about 11,000 ohms at room temperature. -Replace the flood switch if the temperature sensor is bad. We have a IKEA dishwasher sinkende with error code 40 with three audible beeps. I have a White-westinghouse dishwasher and it shows error code (F9 = Not even). What is the part generates this error? i have a white westinghouse dishwasher showing E3 error, what does this mean? I have an Ikea dishwasher (apparently made by Electrolux). Error code 50 is flashing and the dishwasher won’t start. I can’t find the manual so have no idea what the problem is. The dishwasher has been plumbed in and used for no more than 6 weeks. Fault on the wash motor circuit. On some Electrolux dishwashers the motor has a control board located at the back at the bottom just behind the wash motor. Check the motor to be sure all wire harnesses are connected securely. I have a maytag dishwasher model number mdbh965aww. It’s a legacy series quiet series 300. I have a flashing number 9 and a rinse only green light showing. Please help! The Maytag Dishwasher tech sheet shows FLASHING NUMBER 9 may be an issue with the keypad in the touchpanel has shorted. I have a Beko DW686 dishwasher displaying code Er3. When set away it fills with water and starts heating the water. The water does not circulate so the heater cycles on its overheat stats. I have checked that the circulation pump is not blocked or stuck but am unable to test the pump motor without further information as to its wiring (it has two plugs with two wires each). I have checked the thermistor which reads 57k at room temperature. Most likely you have a bad circulation pump on your Beko DW686 dishwasher. Take it out and test. If faulty, repair or replace. As I said, the circulation pump motor is connected with two plugs, each with two wires, so not just a case of connecting 240v to it to see if it works. Does anyone know how to test this? Is my thermistor OK at 57k? I have a Bellini dishwasher model bdw127 w f and is 3 years old. It starts and maybe halfway through starts alarming and flashing the padlock key symbol and 6h symbol. I have reset it by turning all power off for days and still it does the same. Any ideas what this means as its been discontinued and no manuals available. BELLINI Dishwasher key 3 & 5 flashing beeping means Heating element issue. Check heating element for faults. 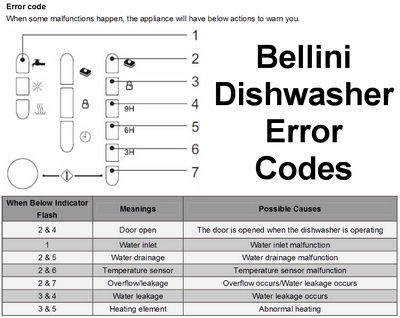 Here is the Service Manual for a Bellini Dishwasher BDW127W-F.
My Rank Arena dishwasher is showing error E3 I don’t know what that is as I haven’t got the manual. Please supply us with the model number of the dishwasher and we can assist further. Where would I find the model number? Usually on the inside door of the dishwasher on the side. It is very difficult to see the model number of the dishwasher as it is up against a bench but I think it reads W60A1A4018. Unsure if it ends 8 or B. It wouldn’t be 2 years old. My whirlpool adp6000ix has error code 3 , according to the manual either the heater element or temp sensor is at fault. I have replaced both and the problem still there. Is the temp sensor the same thing as the thermostat or thermistor. I have rechecked the plugs and connections, test resistance in each unit even the old units test the same as the new? Yes the temp sensor is the same as the thermistor. You replaced the heating element plus the temp sensor and you still get Error code 3 on your Whirlpool dishwasher? Have you made sure you checked everything with a multimeter to see if there is a bad wiring harness or similar?